I’m participating in The Kitchen Cure. I’ll track my progress here, and in this flickr set of before and after photos. Today’s assignment was to work on a special project of your own choosing. Today’s assignment was to work on a special project – examples given include painting, setting up a composter, etc. (Though they did at least note that in some cases it might be more like “do planning for a special project.”) I’ve decided that figuring out some sort of liquor cabinet situation will be my special project. I have actually already gone through the Ikea catalog to see if there’s anything that might work. Last night after posting, I spent some time writing up a big master list of all the things I’d like for my kitchen, which does work into the Day 6 assignment of making those purchases, so I’m counting that done. It includes replacements or upgrades of items I already have, as well as totally new things. The list includes everything from new oven mitts to an enameled cast iron dutch oven. There are a couple of things I’d like to get sooner rather than later, but most of it will remain on my Amazon wish list, at least for the time being. I worked on a couple of things today. I fiddled around with some boxes that I had on hand and figured out how to use them in places where I’d made a note to purchase a plastic bin. So two shipping boxes, a spare box from canning jars and a box that some bourbon came in were pressed into service and a bunch of storage item purchases came off my list. I also started in on the deep clean. 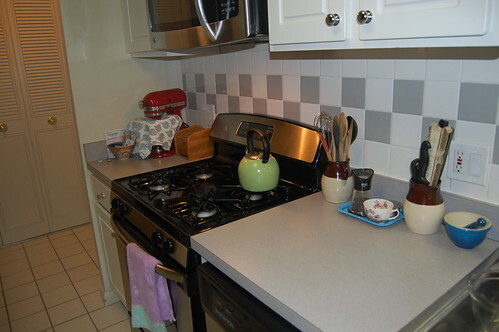 I cleared the counters and gave them a good scrub, wiped down the tile backsplash, scrubbed the sink with Bar Keeper’s Friend, and shined up all the stainless steel facades on my appliances. A couple of things got rearranged, but overall it probably doesn’t look very different from when I started.